Very strong performances from Ten York, Haven on the Bluffs and College Condominiums made November 2012 the 5th best month for high rise sales in the GTA (13 yr avg). 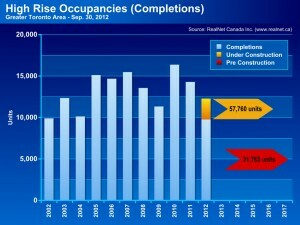 1,556 high rise and 920 low rise sales were reported in November for a total of 2,516 new home sales. Remaining inventory for high rise also decreased for the first time in 4 months, moving down to 28,926. Low rise inventory edged up slightly in November, reaching it’s highest level since December 2010 (but still very low overall). >>For more information and a statistical backgrounder download the full PDF.